WECOMA Creekside: Things provided versus what guests might want to bring. Ocean view, 50 feet from water. 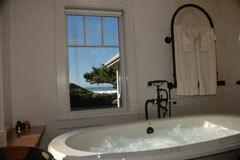 Great for business retreats and vacation rental in Lincoln City on the central Oregon coast. The items listed below will be at for your use and enjoyment. You might want to bring the items listed below if you have special needs, sizes, or other preferences. A wagon is available for hauling your stuff into the house. 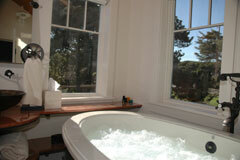 Ocean view from jetted tub for two. 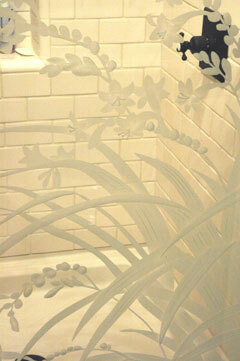 Turkish towels and Myson towel warmers. Hand held shower. Grab bar. Oil rubbed bronze hardware. Custom tailored polar fleece robes with hoods, in various sizes and colors. 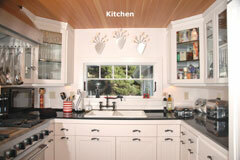 Many are stored in drawers under the utility credenza. Cream towels from the bathrooms not used outside. 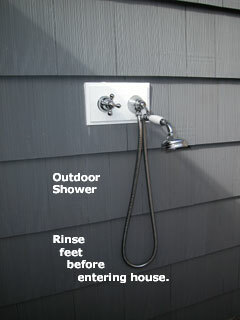 Outdoor, always warm for rinsing off sand before entering house. Lots of different silly slippers, fancy feet, and socks. No shoes are allowed inside the main house to protect the tile and carpets. With the glow of the outdoor lights on gardens at night, you can bask in bubbles in the extra long jetted tub in the main bathroom and view the ocean surf and waves. Luxurious sheets, pillows, pillow cases in 100% Egyptian cotton imported from Italy; blankets are merino wool and Australian wool imported from France; special quilts; thick soft colored towels. Hypoallergenic alternatives available. Exceptionally comfortable beds with sumptuous pillow-top mattresses and deep fluffy quilted mattress pads. 200-gallon quick-recovery gas hot water heater ensures you'll always have plenty of hot water. Towel warmers in the bathrooms ensure your towels will be toasty warm when you reach for them and will dehumidify the bathrooms. Bring your favorite book, just in case our libraries don't have enough books to keep you occupied. 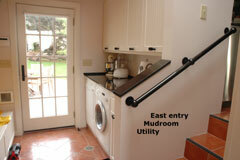 Many on separate dimmer switches that let you change the mood of any room with the simple slide of a switch. Expansive patio protected from the wind, lets you sun in solitude, savor quiet conversation, or gather in large group get-togethers. Two chaise lounges with pull-out trays for your special food and beverages, one round table with six chairs, all with comfy cushions, as well as benches let your cares float away as you sink into relaxed comfort out on the lawn or patio. From the front door, walk down a gentle slope, approximately 50 feet to the water. No steps to navigate. You'll have seven miles of beach to explore. In general, assume the weather will change a lot, even over the course of a day. So bring clothes for warm and chilly weather, calm and windy days, rainy and serenely sunny days, nights with twinkly starlight as well as stormy blows. 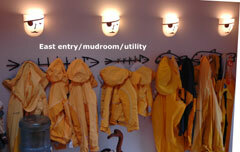 Rain gear, including jackets and pants and waders. Hats, jackets, and pants that are windproof and waterproof, and cover your ears in a blustery walk on the beach. We provide many but you may want your own. Bring your own wet suit, booties, gloves, and hood if you have them and want to spend much time in the ocean or Devil's Lake surfing, sea kayaking, or just horsing around. The ocean in our part of the Pacific is cold! Devil's Lake is warmer. Rubber boots for walking on the beach and splashing through the surf and rivulets wending their way to the ocean. No bike rental companies in Lincoln City. Food Basics: Sugar, salt, pepper, flour, spices, tea, coffee beans, hot cocoa mix, crackers, snacks, balsamic vinegar, extra virgin olive oil, grape seed oil for high temp wok cooking, various sauces for grill or barbecue, and some other staples. Joy of Cooking. 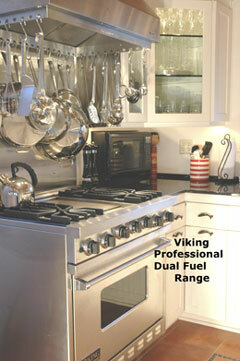 Viking dual fuel professional range, includes 4 gas burners on top, plus a griddle. SubZero side-by-side refrigerator with automatic ice-maker. Two waffle irons, standard and Belgian. 4-slot Dualit toaster from Great Britain. Tea Kettle with pitch pipe whistle. One Chicco Mamma high chair with toy tray. Additional high chair available with advance notice. One Graco Pack'n Play playpen / bassinet. Elegant service for at least 12, or mix and match for a crowd. You can be creative in making each meal memorable. Multiple mugs, cups, latte glasses, beer steins. Four types of wine glasses, including champagne flutes. Stainless knives, forks, spoons, and steak knives. Dishes, cutlery, glasses, serving bowls, for over 12 people, which can be doubled up for larger groups. 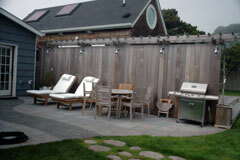 Decks - protected from wind, with tables and chairs and chaise lounge seating for large groups. 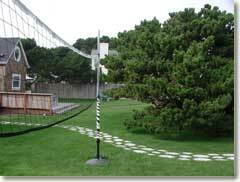 A very large fenced yard provides privacy and security and protection from the wind. 5 TVs, each of which can tune to any satellite TV channel, regardless of channels being watched on any other TV. Bring your own favorite CD's or movies on VCR or DVD format. Rentals are available nearby. Satellite TV with surround sound entertainment system, including CD, DVD, VCR, tape cassette deck. CDs & DVDs - Over 75 DVDs for viewers of all ages. costumes to try, e.g., Captain Hook and Spider Man. You may use the backyard for outdoor games stored in the teak storage chest on the patio or in the storage closet near the outdoor shower. to play one-on-one in Wecoma Park two blocks south, on NW Jetty Ave.
Pail and shovel - plastic. Spotting scope for viewing whales and boats and crashing waves. 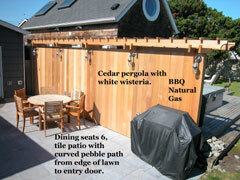 Space for large groups or smaller places to get away for quiet contemplation. All with ocean views. 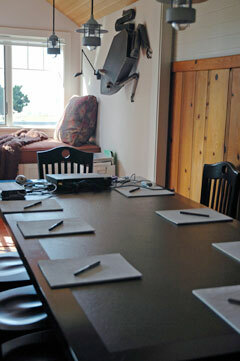 Dining/Conference table seats 8. 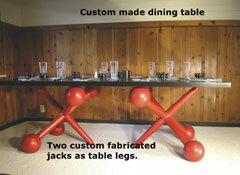 Available table and chairs to extend the length of the table available with advance request (stored elsewhere). Fax, copier, scanner - flat-bed (Hewlett-Packard OmniJet 7130 color or black and white). Printer - Hewlett Packard Business Inkjet 3000 printer: color and black and white printer, parallel cable. Download drivers for this printer and your computer before you arrive. Free to our guests: Unlimited long distance calls within the US, with no need for a charge or calling card number. 900 numbers blocked. No collect calls accepted. Multiple voice/data lines in every room. Dual-line digital phones in most rooms. One is in the window seat; the other is Below Decks. You can move them around depending on your communications needs. Can function as baby monitor. Clock radios or alarm clocks next to every bed. Catering available from at least 4 providers within 1/2 mile of . Bring your own. We found we couldn't meet everyone's needs and had too many maintenance and technical support problems. for your personal needs during your stay. Guests are not expected to wash towels or sheets. If you desire maid service during your stay to wash or clean or change linens, that could be provided for an additional charge and at least two weeks advance notice. Garbage sacks under sink. In-house garbage container also under sink. Three garbage cans in locked storage behind back fence in parking area for your garbage. Security system with keypads at each of two exterior doors automatically forwarded to offsite monitoring system. You will receive your own unique code that will operate the system during your stay and will be disabled after you leave. No one else will ever have that code. Use it to protect yourself. The system records all entries and exits and the unique codes used during those entries and exits. A generous first aid kit is supplied in the laundry room. Hospital emergency room 24-hrs seven days a week is less than 1.5 miles from . Directions provided at the bottom of our Maps and Directions web page. Call ahead if you will need prescriptions filled during your stay. Three-fourths mile from , Safeway Pharmacy should be able to meet your needs with some advance notice.